Maud Olofsson grew up in Högbyn, in Örnsköldsvik Municipality, Västernorrland. She started her political career as an ombudsman of the youth organisation of the Centre Party in 1974, and served as a member of the local council in Luleå from 1976. From 1978 to 1981 she held the same job with the party. From 1992 to 1994, during the Carl Bildt centre-right government, she worked as Special Adviser to Minister Börje Hörnlund at the Department of Labour. From 1996 she has been a member of the Centre Party board. From 1997 to 2001 she worked as Managing Director for the Rural Economy and Agricultural Societies (Hushållningssällskapet) in Västerbotten. 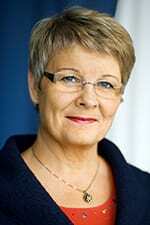 She was elected Party Leader on 19 March 2001, succeeding Lennart Daléus. Her political standpoint could be seen as a traditional Centre Party position, with an emphasis on rural Sweden and the survival of rural communities, combined with centre-right economic policies. It was however a remarkable new feature in the history of the Centre Party, when Maud Olofsson characterized her party's ideology as Social Liberalism. Although the Centre Party in history has sometimes cooperated with the governing Social Democrats, under Maud Olofsson the party opted for a clear oppositional role, strengthening its alliance with the Liberals, the Christian Democrats and the Moderate Party. Following its victory in the elections in 2006, this alliance was able to form a new government under Fredrik Reinfeldt. Maud Olofsson was appointed Deputy Prime Minister and Minister for Enterprise and Energy. Maud Olofsson is married to Rolf, a relative of Jennifer Granholm (former Governor of Michigan) with whom she has three children.